We are a leading Manufacturer of stainless steel wall and ceiling panels from Bengaluru, India. Stainless Steel Wall And Ceiling Panels made of 1 or 1.2 mm thick stainless steel sheets 304 grade. Packaging Details: Steel container type cabins are made for oil field and Battlefield accommodations, offices, clinics, Radio rooms, recreation halls, ablution units kitchen and dining halls etc. These cabins are rigid in construction and suitable for frequent movements from one location to other in the oil field and battlefield. Container cabins with Winching bars are manufactured by us for specific needs in the oil field to winching away from location to locations. Container cabins on wheels are also in our production range. 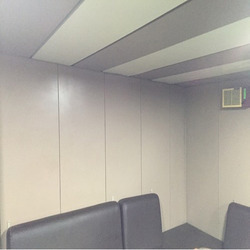 We also undertake shipping container conversion work to suit the specific needs of the customers. Fire Rated Steel Cabins are our specialty product for meeting the specific needs of our customers. Looking for Stainless Steel Wall And Ceiling Panels ?